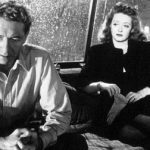 The Intriguante—Women of Intrigue in Film Noir series starts tonight at the Skirball Cultural Center in West Los Angeles with “The Woman in the Window.” See previous post for more details about the series. 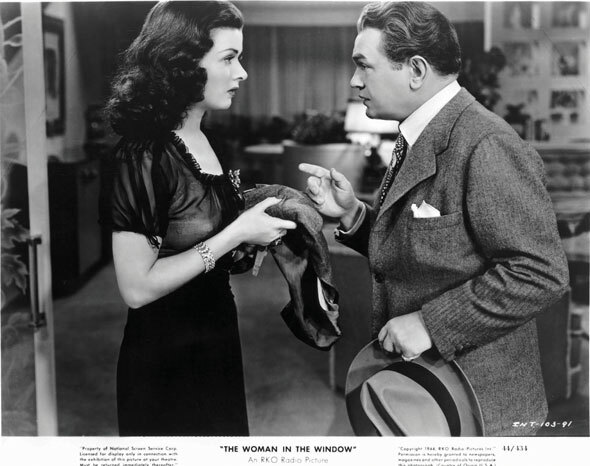 The Woman in the Window/1944/Christie Corp./99 min. When you least expect your life to unravel is exactly when your life will unravel, at least in a Fritz Lang film. Take “The Woman in the Window” from 1944. Professor Richard Wanley (Edward G. Robinson) lives a cozy bourgeois life – he gives lectures on Freud by day, enjoys after-dinner port and cigars by night. But by the end of this night, Richard will be covering up a murder. Richard leaves the club after their booze-fueled yack-fest and lingers at the window of the art gallery next door. While he gazes at the creamy-skinned, raven-haired lady peering out from the canvas, another creamy-skinned, raven-haired lady materializes – it’s the model, a woman named Alice Reed (Joan Bennett). 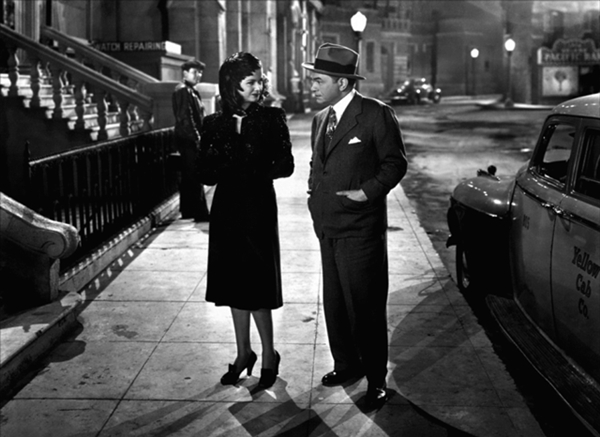 Alice (Joan Bennett) is the woman in the painting Richard (Edward G. Robinson) and his friends admire. After chatting over drinks, she invites him back to her splendidly appointed place. Just as they’re getting to know each other, her flashy peacock boyfriend Claude Mazard (Arthur Loft) barges in. Clearly, Alice and Claude haven’t had that “Are we seeing each other exclusively?” talk and violence erupts. Claude’s rumored “disappearance” doesn’t fool people for long – the cops are digging for info, Richard’s pals Frank and Michael chatter about the case endlessly, and a sleazy associate of Mazard’s named Heidt (Dan Duryea) sees a plum opportunity for blackmail. Alice and Richard are randomly bound together. Sharply written and brilliantly acted, “The Woman in the Window” proved a box-office hit. Nunnally Johnson produced the movie and wrote the script from the J.H. Wallis novel “Once Off Guard.” The movie’s original score, a group effort led by Arthur Lange and Hugo Friedhofer, received an Oscar nom. Vienna-born Lang infuses the film with fatalism, despite its upbeat ending. “I always made films about characters who struggled and fought against the circumstances and traps in which they found themselves,” he said. And, as usual, Lang pulls out all the visual stops, suggesting powerlessness, alienation and doom. A signature noir shot is Claude entering the shadowy lobby of Alice’s apartment building, against the backdrop of a lonely, rainy nightscape pierced by the glare of a neon clock. Later his body will be draped in more shadows, in the back seat of Richard’s car. 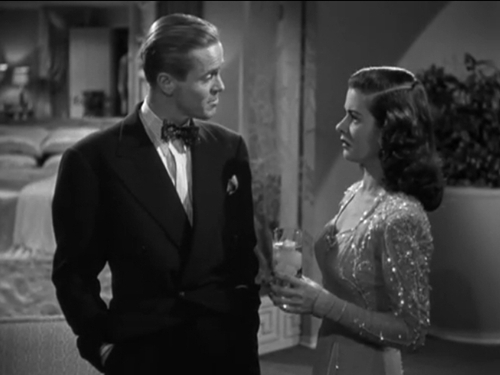 Alice and Heidt (Dan Duryea) make a bad but beautiful team. Though he got typically great work from his actors, Lang also had a reputation for being difficult. But he clicked with Bennett. Maybe he appreciated the sacrifices she made for her art – a natural blonde, Bennett dyed her hair black. 😉 She also had lots of drama offscreen – she married four times and endured a scandal after her third husband, producer Walter Wanger, shot her lover in the groin. (Her second husband was producer Gene Markey). Lang and Bennett made four (almost five) films together: another famous noir, 1945’s “Scarlet Street” (which also starts Robinson and Duryea, and is definitely the darker of the two), “Man Hunt” 1941, and “Secret Beyond the Door” 1948. Bennett also starred in “Confirm or Deny” 1941, but director Archie Mayo was brought in to replace Lang. The mood of “The Woman in the Window” is pure Lang, and much of that mood comes from the actors. Duryea convincingly plays a slimy loser while, in reality, he was a standup guy. It’s a testament to his versatility that Robinson, though famous for his tough gangster roles, is completely at ease as the innocent, cultured professor caught in a film-noir web. Best of all is Bennett, noir to the nines, spinning that web.